Please carefully consider what flooring materials may be used in the future when planning joint fill applications. In many cases there may be no issue, but with certain types of impermeable flooring choices being used as an overlay, using what is known as a semi-rigid joint filler may conflict with best practices. This bulletin is to inform customers about the “best practices” for using semi-rigid joint fillers (polyurea or otherwise) in typical flooring applications. While VersaFlex makes no guarantee that following these guidelines will result in a more usable product, it is our estimation that these suggestions should be touchstones for best practices during projects, from the design phase through completion. These joint fillers and sealants have been specially formulated to handle continual heavy abuse from all sorts of vehicular and pedestrian traffic. However, the very nature of concrete and its thermal temperature cycling in the environment causes expansion and contraction issues at any joint between slabs. Furthermore, because concrete is a porous material, it will act like a sponge, soaking up any moisture available and expanding as a result. 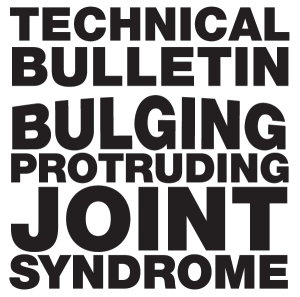 This can have adverse effects on any joint fillers that have been installed at the industry recommended full depth. Bulging / protruding joint filler is considered to be a rare occurrence, and is often assumed to be a problem with the joint filler material and/or installation methods, but most often this is not the cause. This condition can be found in less than 1% of joint filler installations in uncoated concrete slabs, and is reported to be less than 5% for coated slabs. Typically when this phenomenon is initially observed there is a significant weather event associated in or around the first indications of protruding joints. The weather event could be extreme rainfaill or periods associated with high humidity. Geography does not actually play much of a role here, as this can happen regardless of location, in both hot or cold climates. As concrete is a porous substrate with tiny air capillaries running throughout its matrix, it will absorb any moisture it comes in contact with. When there is extreme humidity and rainfall, water will migrate to the concrete slab from below grade as well as from the surface. The concrete will absorb moisture / water in astonishing volumes. As the concrete absorbs this water, the concrete only has one physical thing that it can do: expand as it absorbs more and more moisture. The laws of physics have now taken over, and the concrete expands and swells dimensionally. With this expansion, continual pressure occurs on all the joints installed in the slab. The joint fillers’ openings have been reduced, and the path of least resistance under this extreme pressure is being squeezed together and upward. The expansion is literally forcing the joint filler material up and out of the joints. This is the bulging and protruding that is seen from the surface. Concrete contains more water than is strictly needed to hydrate the cement into the mix with the aggregate. As concrete goes through its hydration process (often for months after pouring), the excess moisture is trapped within the slab until it can find a way to escape, typically through evaporation at the surface. This is why relatively new slabs can seem dry at the surface, but can still be quite damp in the lower portions, as there is often nowhere for the moisture to escape except through the surface of the slab. Additionally, any moisture barriers or vapor retarders placed beneath the slab will guarantee the excess moisture’s eventual path – up to the surface. However, when an impermeable floor coating / covering is applied, such as vinyl composite tile (VCT), or other non-breathable materials, the slab becomes encapsulated, and the moisture trapped within the slab has nowhere to left to evaporate. Thus, the moisture keeps diffusing through the slab, as the moisture begins to equalize throughout the mass of concrete. As this moisture is added to the top, previously dry portion of the slab, the result is an expansion of the concrete. When sufficient expansion takes place, the semi-rigid joint filler is compressed. Since the filler is restrained on the bottom, there is nowhere left for it to go but up. As moisture equalizes throughout the slab, the concrete expands linearly, meaning joint openings are reduced, forcing anything within those joints to move along the path of least resistance, in this case bulging and protruding from the joint channel. There is no exact science for the repair of this syndrome. It would seem very simple to razor cut the protruding material level again with the slab. There would seem to be reasonable expectations that this fix would solve the problem; however, this may or may not be the perfect solution. We have observed slabs where the excess joint filler has been removed from the surface; sadly, many present the bulge again. Additionally, as the moisture content of the slab reduces in volume and the slab shrinks back to its original size, the joint filler can appear concave or under filled due to the shaving of the bulge. There is no way to predict successful correction, as it is dependent on the moisture content stabilizing. If bulging areas are left uncut and heavy hard wheel traffic is present, the risk of breaking the semi-rigid joint filler and the possibility of fracturing the joint edges due to compression is greater. The safer bet would be to shave the joint again if needed for traffic and then to mill and cap the joints once the building has stabilized. It is recommended that joints under floor covering NOT be filled with a semi-rigid material. Contact floor covering manufacturer for recommendations. Contact VersaFlex for advice on which joint filler to use, and how/when to install. Additional Resources: The American Concrete Institute has a publication available entitled “302.2R-06: Guide for Concrete Slabs that Receive Moisture Sensitive Flooring Materials” that goes into great detail on the subject of covered floors, including slab re-expansion from moisture. Contact ACI at (248) 848-3800.